I love tea. Even when you make a basic cup with a bag, there’s still a little ritual around it, something that soothes me and smooths out the rough edges of my day. I also love the subtle (and not so subtle) variations in flavor available in tea, especially when you throw herbal tisanes into the mix. Even without that, the flavors of tea range from light and sweet to dark and earthy or smoky and I find each of them interesting. So, my tea. I’ve got a cabinet dedicated to it. Top shelf is hard to get to without a chair, so it’s now holding my fancy flower blossom teas as well as a few empty containers waiting for my next loose leaf purchase. Middle shelf is most of the boxed teas. 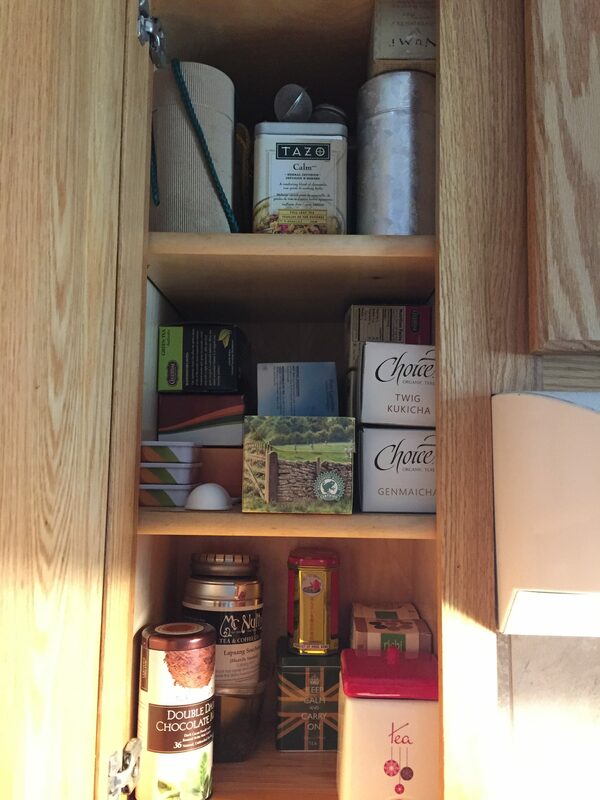 Celestial Seasonings, Choice, Yorkshire, and Twinnings. I’ve also got some Adagio fandom teas that are tasty and special to me. Bottom shelf has the tins and a couple special teas. This is where my beloved Pu-erh lives. I’ve also got a tea bag dispenser that holds a couple chamomiles to keep them handy and the last of my bagged Twinnings Lapsang Souchang. I still need to work up a list, but this is a nice little overview of what I’ve got on hand. I need to remember to pick up a nice white to go along with my greens and blacks.